Common Misconceptions of Texas Estates: The passing of property - Johnny W. Thomas Law Office, P.C. 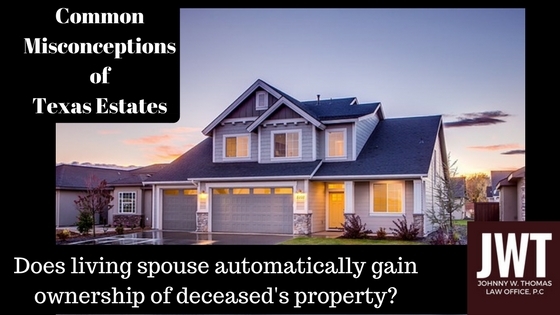 The Misconception: If my husband or wife dies, their property automatically passes to me. It is easy to assume that when a spouse passes away, the surviving spouse should automatically gain ownership of the deceased spouse’s property. For example, Bob and Sue have been married for years and live in a home they bought shortly after getting married. If Bob passes away, it is easy for Sue to assume that she is now the owner of the home. She may further assume that she is free to gift the home to her sister after death in her Last Will and Testament. This may be correct, but legal action must be taken in order for title to pass correctly. When a loved one passes, it is important to seek legal counsel regarding both probate proceedings and alternatives to ensure property of the deceased is properly distributed by law. The law is written to be fair, and does not take in to account the wishes of the decedent. Let’s look at the example above. Without getting into the details of marital property, here is a quick review. Community property includes property that is acquired by spouses after marriage. Each spouse owns a 50% interest in all community property. The house that Sue and Bob live in was bought after the marriage and is considered community property. This means that both Bob and Sue own a 50% interest in the home. When Bob passes, Sue must complete a probate or a probate alternative to gain legal ownership of Bob’s 50%. If Sue fails to do so and she creates a will giving the home to her sister, she will only be giving her sister 50% interest in the home. It is important that title is properly passed after the death of a loved one. Issues will eventually arise, if not for you, for your family members in the future. If a loved one has recently passed, seek legal counsel regarding your options as soon as possible. Take care of this now to avoid problems in the future.